We are proud to have provided this facility for St Lawrence Primary School and its active student population. A large area, which was practically unplayable at St Lawrence Primary School has been transformed into a year-round multipurpose facility for active play and physical education. Comprising a large school oval, volleyball courts, four lane running track, four square courts and long jump pit, new customer St Lawrence Primary School, chose Grassports Australia having seen our other projects and our comprehensive range of high-quality Australian made products. 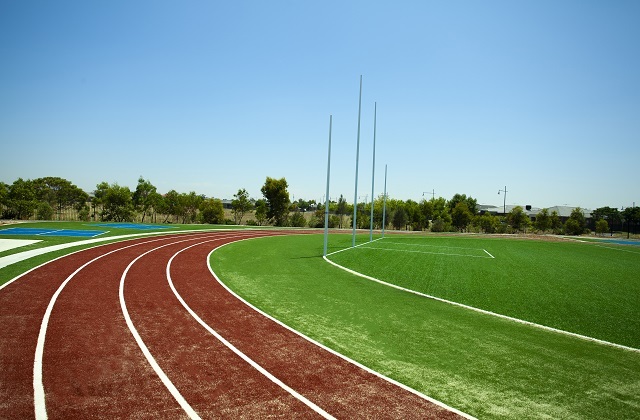 In-house Grassports Australia expertise meant that base construction could be carried out to safeguard the longevity of the facility. With reactive soil on the existing field, a capping layer was required, ensuring a stable base. The base includes 2500 tonne of crushed rock. Using approximately 4000m2 of long pile synthetic grass best suited for soccer and AFL, the new AFL goal posts are fitted with protective padding for safety. Sand and rubber crumb were used to infill the infield with sand only on running track and sports areas.